I’ve been baking bread for many years now, but I like my bread crispy and chewy on the outside, and soft and doughy on the inside. When you’re baking bread in a loafpan, it’s just hard to replicate that kind of texture. My longing for that kind of bread only increased when a lovely little bakery opened in our town a few years ago. They have the most delectable artisan style breads. Truly. Since my sweet little daughter sometimes babysits the owners’ two girls, I’ve tried most, if not all, of their wonderful breads. Eating their bread just made me tired of the soggy, limp crust I got when I baked my own. I have a normal oven with a convection feature, but even the swirling air of the convection just didn’t do it. Looking up recipes one day, I came across something called a HearthKit. Understanding my deep-rooted “foodie” tendencies, my wonderful husband bought it for me for this past Christmas. It’s basically a 3 brick insert you place in your oven. It’s… AMAZING! Even though I loved making my own bread before, I honestly feel like I can create an artisan loaf in my own home. And it’s so simple! 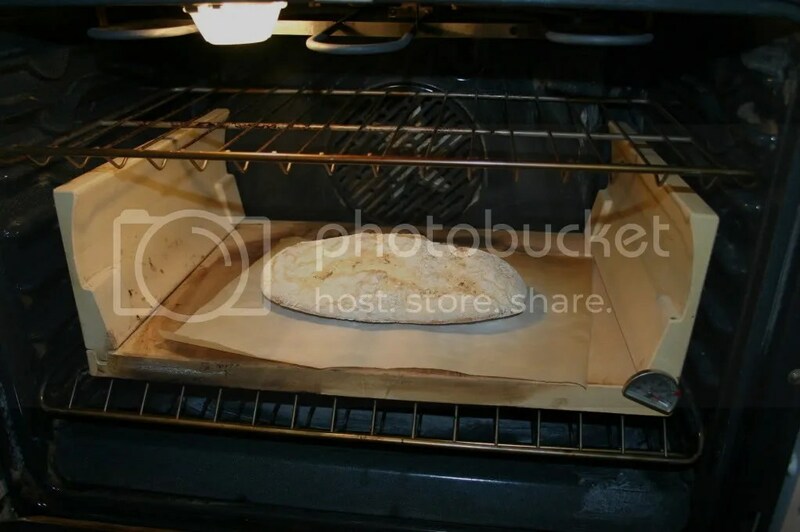 Unless you’re cooking a bunch of things simultaneously, and you need the extra room, it just stays in the oven all the time. You preheat the oven to a very high temperature, and the brick holds the heat. Even if you’re making a pot roast, foods tend to be done a bit more quickly, are juicier, and more evenly cooked all around. When it comes to cooking bread, it couldn’t be easier. You make the dough as you normally would, and then place it almost directly on the brick (it’s a lot easier to remove if you put it on parchment paper first). I normally sprinkle a little cornmeal on the parchment, and by the time it’s done, it looks – and tastes – like something you’d pay top dollar for. The same goes for homemade pizzas; once in your mouth, you’d swear you were eating something you bought at the restaurant. I still go to the bakery (they have fabulous desserts and sandwiches I could never begin to duplicate), but when I want my favorite cranberry pecan loaf, and they’re not making it on a Thursday, I just make my own! Put warm water into the bread machine. Add butter. Add whole wheat flour, bread flour, sugar, dried milk and salt. Make a small well in the center of dry ingredients; put in yeast. Add additional ingredients if desired. Set machine on dough cycle. Remove from bread machine, put on parchment paper dusted with cornmeal. Allow to rise for 10 minutes, then cook at 425 degrees for 30 minutes or until brown and crusty. Thank you! It’s something I love to do!